John Paul Strain Hand Signed and Numbered Limited Edition Giclee:"Scarlet Sky"
Image Size: Paper 19 x 25/ Canvas: 18" x 23.5, 24" x 31" and 30" x 40"
About the Art: Stonewall Jackson's Valley Campaign was a complete success. Jackson had been given what seemed to be an impossible task by General Robert E. Lee. The order was to engage three Federal Armies consisting of 52,000 soldiers in the Shenandoah, and prevent them from reinforcing US General McClellan's Peninsula campaign on Richmond. Lee closed his written orders to Jackson with the words, "The blow wherever struck, must, to be successful, be sudden and heavy." As General Banks' Federal army fled Winchester in disarray, Southern troops entered the city. From every street, the citizens of Winchester greeted the columns of Jackson's troops. A North Carolina soldier said, "As we passed through Winchester, the whole town seemed mad with delight, cheering us at every stop." General Jackson attempted to continue the pursuit of General Banks' force, but his men were exhausted from the days of hard marching and the rigors of battle. In the last seven days Stonewall's men had tramped 100 miles and had been fighting for 30 hours straight. Jackson looked for Col. Ashby's cavalry to finish off the fleeing Federals, but Ashby could not be found. 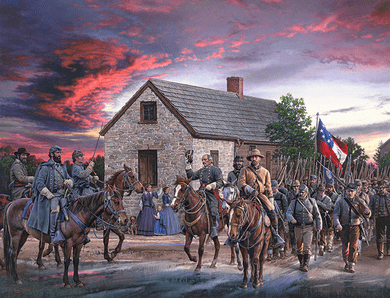 A brilliant scarlet sky seemed to punctuate the last moments of the unforgettable day, as General Jackson reviewed more of his soldiers arriving in town. A soldier from Ewell's division wrote: "Yonder, in a gray coat, on Old Sorrel, came Stonewall himself, his eye bright with victory, his hair fluttering in the wind, the very cyclone of battle." The day had been one the town of Winchester and the great Stonewall Jackson would never forget. -J.P.S. No thank you, I just want the 19x25 unframed print.